You know what's good about being in the virtual world? Well you can do virtually anything (boom tish). Like go on a book tour without ever leaving the comfort of your own house, or even getting out of your jim jams. 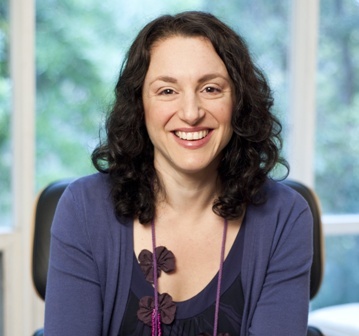 When I first met Jodie from Parent Wellbeing, she had just been interviewed on television (not in her jarmies, don't worry) and I remember thinking that was pretty cool. Then after a few minutes of chatting and the obligatory blog stalking that followed, I thought she was pretty cool - because her site, and her new book, don't come across as preachy "this is how you have to do it" parenting. Rather, it's a "trust yourself and make your own rules" style. LOVE THAT. 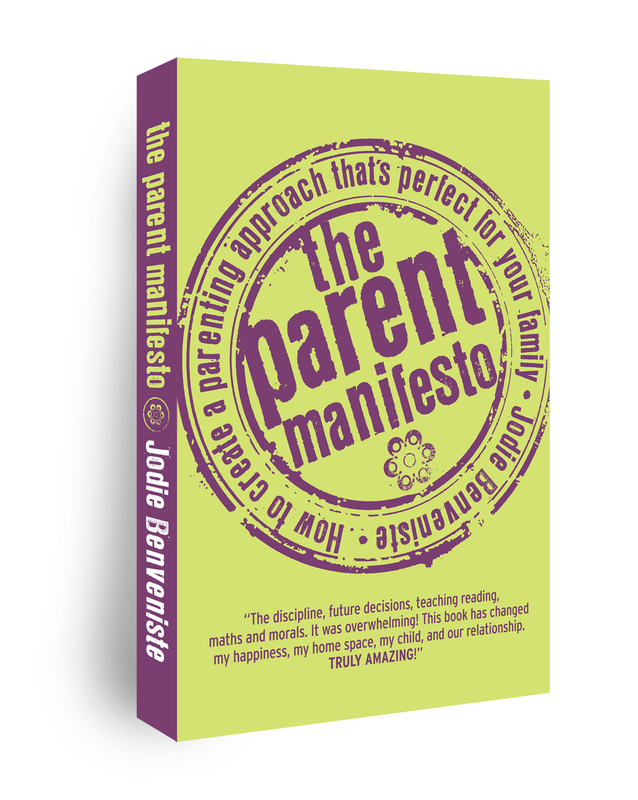 I was lucky enough to receive a copy of Jodie's new Parenting Manifesto and have her answer my not-so-professional questions as part of the bloggy book tour. 1. Throughout the book there are a number of exercises to complete... You've given me homework? I did do it but, um, err, the dog ate it... Am I in trouble? No you’re not in trouble! It’s completely up to you which exercises you complete, or whether you do any at all. But I have found that people who go through the entire process end up with better outcomes. It’s not homework as such, it’s more a process to help you decide what you want for your family, and a way to try and achieve that. It takes a little bit of effort and commitment but the results can be amazing – so well worth it! You can stick your manifesto wherever you like! Your manifesto is essentially a set of statements you’d like to live by as a parent and as a family. It’s important to keep them front of mind, which is why many people stick them on their fridge. But sticking them in the toilet is a great idea! 3. I love that the book comes in PDF so I can show off on the train with my iPad. Do you think technology has affected the way we parent as much as it's affected the way we read books? I reckon parents are feeling more isolated these days. One of the great things about technology is that it can bring people closer together. You might not find like-minded parents in your local mums group but you might find them online instead. The online community that built up around The Parent Manifesto when we ran the first 12 week program was phenomenal. Very supportive and reassuring. No flaming or grandstanding at all! Plus, I reckon technology allows us to deliver parenting info in new ways. Instead of having to book a babysitter and attend a parenting workshop, you can access everything online in your own time and from home. Much easier for busy parents. 4. In one of the parent to parent sections a mum comments how her daughters are so different and if she could combine them she'd have a super child. Aunty Penny and I always say we're two halves of the perfect person. Oh, sorry, this isn't a question, I was just sharing. 5. Coming from a rather dysfunctional family, a lot of the exercises made me really think (until my brain hurt) about how I can overcome my past to ensure a bright future for Tricky. Do you think the manifesto would be a good tool for someone like me who is paranoid about history repeating (and I’m not talking about the Shirley Bassey song)? One of the main reasons history repeats itself (in a parenting rather than a Shirley Bassey way) is through lack of self-awareness. We don’t even realise what we’re doing until it is too late. 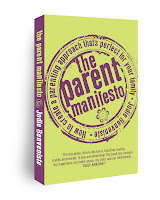 Your manifesto helps you to be more self-aware and more intentional as a parent. That can only help. The other thing that helps is focusing on creating a positive future for your kids rather than trying to stop the negatives from happening. You can be the parent you want to be by creating new patterns rather than repeating old ones. 6. There are a lot of pages and only 2 or 3 pictures... What's with that? If you like I can draw some for you? I’m pretty good at Draw Something, what do you reckon? The book does have some diagrams and break out boxes and key points, but not lots of pictures, no. Sorry! But please, draw away! Perhaps we could put all call out for parents to contribute their manifesto drawings and put them on Pinterest! 7. The 10 steps of parenting on page 110 mention religious participation. When I read it I thought I might be struck by lightning but luckily I was inside. What about the heathens like me? Those 10 competencies are a guide. Religion comes down at number 9. I’m a heathen too and I’m not concerned by this at all. The main point I wanted to illustrate with the parenting competencies is that if you want good outcomes for your kids, it’s much more important to be loving, manage your own stress and foster a good relationship with your partner (if you have one), than worry about which behaviour strategy you’re using with your kids. Religious participation is clearly optional! 8. If there is one thing you want parents to take away from this book, what would it be? You are your own expert. You can raise your kids with confidence, not worry about what everyone else is doing, and enjoy the best of family life if you take responsibility and make it happen. It’s something everyone can achieve. Thanks so much for allowing m to be a part of your blog! So I'm the expert, history doesn't have to repeat, I don't have to be religious and I can draw the pictures? WINNING! 2. Website membership with access to extra online resources, tools and information to help you through the program, including ways to stick to your plan even when you’re having ‘bad’ days. 3. Regular support and encouragement throughout the 12 weeks from me and other supportive, like-minded parents in the program. We’re a community, and we’ll do it together! Valued at $97. More info here. To enter, leave a comment telling me what piece of "expert advice" you've been given about parenting that has made you roll your eyes. For an extra entry share this competition on Facebook tagging Where's My Glow? and/or Twitter tagging Glowless. Entry is open to everyone. Entries close at 10pm AEDST on 25th April 2012 at which time four winners will be chosen based on creativity. Make sure you sign in to the comment platform with a valid email address/twitter handle or leave your details as part of your comment so you can be contacted. Winners have one week to reply to notification, failing that, the prize will be redrawn. Enter glowless@wheresmyglow.com in to your contacts to make sure it doesn't go through to spam!! The prize is provided by Parent Wellbeing and is not transferable or redeemable. And thank you Glowless and Jodie for such a fab opportunity. My dad feed my daughter icecream at 4 months old. His advice "Grandparents are allowed to spoil their grandchildren".. NOT at 4 months old!!! Although she did love it. What an interesting sounding program! I would roll my eyes any time anyone, known to us or strangers, would respond to my girl crying/wriggling/sleeping/breathing with "She's teething". Uh-huh, sure she is. We got those comments from the time she was only a few weeks old and onwards, she didn't get her first tooth until after she'd turned 1! Oh wow, you should have been a journalist Glow. I'm sure Jodie will rate this interview up there with her appearance on breakfast tellie. You're so freaking funny ;) So what pictures will Jodie be commissioning you for? Glow can do whatever drawings she likes! Thanks again for having me on your blog. Loved it! My mother in law told me to face the pram into the sun while taking my oldest for a walk to force him to close her eyes and sleep ! I was never tempted though - poor baby ! My MIL loves to tell me that she slept her kids on their tummy/used cot bumpers/had pillows in the cot/soaked everything in epsom salts/bleached the heck out of nappies/etc etc and her kids turned out ok... Sigh. I bought the ebook a while back but, with almost every book I've purchased the past 3 years, I've not read it (my bad). Thanks for giving me a snapshot into it. Love your interview style.